Pain that radiates from your lower (lumbar) spine to your buttock and down the back of your leg is the hallmark of sciatica. 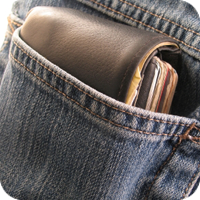 Occasionally, sciatic pain in men is caused by sitting on a wallet. Pain that radiates from your lower (lumbar) spine to your buttock and down the back of your leg is the hallmark of sciatica. Sciatica may be accompanied by numbness, tingling, and muscle weakness in the affected leg. This pain can vary widely, from a mild ache to a sharp, burning sensation or excruciating discomfort. Sometimes it may feel like a jolt or electric shock. Sciatic pain often starts gradually and intensifies over time. It's likely to be worse when you sit, cough or sneeze.